MOSCOW: ''He came to Moscow to meet me after two weeks,'' said Katya, 33, about the man she met on line in February. ''Now we are texting and speaking every day. He is totally my guy. Sometimes its worth waiting a little longer for the right person.'' He was born in Odessa, but now lives in New York City. Katya was also born in Ukraine, but raised in Siberia. She moved to Moscow five years ago. But now she plans to move to New York. ''I love Moscow, but I feel at home in New York, she said. ULAN-UDE, EAST SIBERIA: Light snow was falling as Medegma, 18, waited for a bus in the shadows of the largest Lenin head in the world. Sporting a New York winter hat, Medegma said she moved to Ulan-Ude from a town about 800 kilometers away to study economics. However, she said economics isn't her passion, so she thinks she will join Russia's armed forces after graduation, mentioning the interior ministry. Medegma said she studied Buryat national dances, loves melodramas and reading, adding that she will reread some books. Her favorites are War & Peace and Quiet Flows the Don. KHABAROVSK: Natasha, dressed in a 'New York' winter hat, was leaving her university with three girlfriends. She said she was studying public service, following in her dad's footsteps and planned on staying in Khabarovsk. I asked what changes she would like to see in her city. "I would really like to see a ferris wheel built," she said. "And that our educational system resembled America's a bit - where you can choose your own subjects; cheerleaders, swimming and beautiful cafeterias." Several people I spoke with in the Far East commented - like Natasha - that there aren't enough recreational or entertainment spots in their cities. Migrants from central Asia not only head toward Moscow and western Russia for work. With Russia trying to develop its Far East provinces, there is demand for construction workers in the region. And due to the tough environment and remote location, pay can be relatively high. 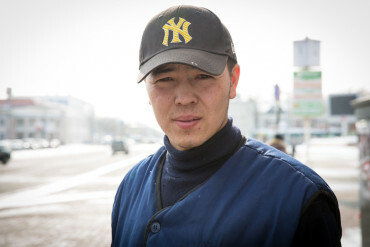 Alik, 22 and a native Kyrgyz, was walking in the center of Sakhalin with his NY Yankee hat and work uniform. He said he was a construction worker for Russia's state rail company and has been living on Sakhalin for five years. He followed his dad, who has been working on Sakhalin for about 10 years. Alik's sisters live back home in Krygyzia. Alik said that he likes Sakhalin's nature, has a stable job and hopes to buy an apartment on the island. He said he already has a Russian passport.